Peter Comestor (i.e. Peter 'the Eater', a nickname given to him because of his voracious appetite for knowledge) wrote the 'Scholastic History' in Paris in about 1170. It is a continuous history, from Creation until the end of the Acts of the Apostles, based mainly on the narrative books of the Bible. This copy was owned by the library of Rochester Cathedral in the Middle Ages. 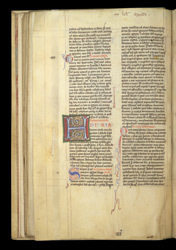 This initial 'H' introduces the section on the Old Testament book of Exodus. Several tolls are provided to help readers navigate the text, including a running heading in the upper margin, marginal numbering of the sections next to each small decorated initial. In the lower margin are a quire number and a catchword.